Great apps are even better when they’re on sale! We’ve selected 34 iPhone and iPad apps that are over 30% off. 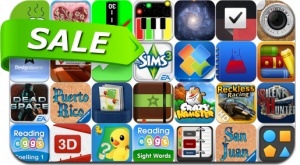 This app deal alert includes Dead Space, San Juan, Puerto Rico, TapDot, Reckless Racing, DesignScene, 100 Cameras in 1, Spin-a-Wind, Office Reader, City Maps 2Go, Free Books, Risk and many others.